Smart home devices like AI personal assistants know our music preferences, our ideal home temperature; smart phones keep track of our location, and fitness bracelets measure our pulse. All of these technologies track our bodies and homes. They extract practical information which they feedback in the form of comfort – nice music, perfect temperature, a route home, or health tips. If these devices could talk, they could write our biography. It's easy to be paranoid about the state of surveillance that technology drives us into. But what else can be done with the information that these robots, sensors and devices collect about us? When asked about dystopian future visions like these, science fiction writer Monica Byrne answered, 'Who cares about your jetpack? How does technology enable us to keep loving each other?' Inspired by her provocation, artist and filmmaker Miranda July's commission titled I’m The President, Baby repurposes cutting-edge smart home technology to explore the storytelling potential of home and body appliances that track, measure or respond to our activity. Smart devices are usually triggered for functional purposes but this project explores their potential to represent emotional states and life stories. 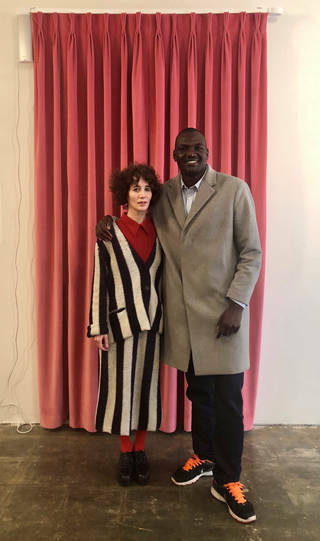 Miranda July and Oumarou Idrissa in front of the Uber curtain, in a studio in Los Angeles, during the testing phase of the project 'I'm The President, Baby'. Photo by Mike Mills. Four smart curtains installed in the gallery are linked to the phone and bed of Oumarou Idrissa, July's friend and collaborator on this project, a young man from Niger who lives and works as an Uber driver in Los Angeles. 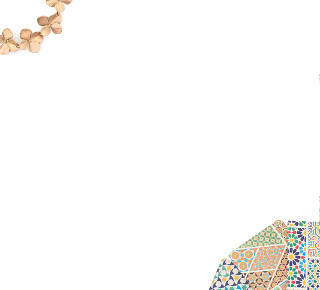 Every time Idrissa wakes up in the middle of the night and WhatsApps his family in Niger, taps Uber, or uses Instagram, one of the curtains opens or closes. Moving in real time, the curtains map the interactions between Idrissa's sleepless nights in LA, U.S., and his family's day time in Niger. Using smart curtains as storytelling devices, this project defies the functional aspect of smart home technologies. Miranda July and Oumarou Idrissa. On 22 August 2015 I called for an Uber, and a man named Oumarou Idrissa picked me up from my house in Los Angeles. He drove me to Malibu in a black SUV. On the long drive across the city, Oumarou told me the story of his life, which began in a village in Niger, West Africa. He came to the U.S. on a student visa, hoping to attend the University of Idaho. When he couldn't afford the tuition, he faced the possibility of deportation and was forced into hiding. He needed to stay in America; his family was counting on the money he could make there. During the worst of these years he was often homeless, which he kept secret. And he always knew that immigration agents were looking for him. He woke up every two hours, thinking: 'They're here'. Now Oumarou is a U.S. citizen – but he still can't sleep more than two hours at a time and never more than a total of four or five hours a night. For this project, I asked Oumarou if he would share his insomnia in real time and he agreed, hoping that telling his story of sleeplessness might actually bring him the peace he needs to finally sleep. We installed a sleep tracker program in his bed, and he began routing his phone data through a custom server that silently detects which apps he's using, since he usually looks at his phone during these restless hours. When it's midnight for Oumarou, the day is just starting in Niger and also here, in London. As he generates information throughout the night, it's sent to the curtains in the exhibition. When the blue curtains are completely closed, Oumarou is asleep on his queen-sized mattress on the floor of his studio apartment in Los Angeles. If the curtains are partially open or moving, then he's sleeping fitfully. His sleep data triggers this movement via a smart curtain track powered by a Somfy® motor. Sometimes he dreams of someone pushing down on him so he can't move or get up. Sometimes he dreams he's in Niger, talking to his mother about ordinary things. If the curtains are wide open, then he's awake. Each time the brown curtains open, Oumarou has opened WhatsApp – the free, secure, worldwide messaging service. Every night around 11pm he begins to talk and message with his friends and family in Niger. 'I don’t have any close friends in America', he told me, 'so my phone is my everything'. He exchanges videos and pictures with his 21 sisters and brothers and responds to requests for money, most often to pay for food, school tuitions, christenings and medicine. He used to talk to his mum every night, but she passed away two years ago. Just before she died, Oumarou texted to tell me she was sick. We had sporadically kept in touch after our long drive together. Just a few hours later he texted me that she had died, and he was headed back to Niger for her funeral. If the pink curtains are open, Oumarou has tapped 'online' on the Uber app, making himself available to receive calls for rides. Like most UberBLACK drivers, he leases a black SUV and often barely makes enough money to cover the cost of the lease. At times he has also lived in his leased cars, as many UberBLACK drivers do. 'When you sleep in a new SUV you wake up sick from the fumes', Oumarou told me. We met up when he got back from his mother's funeral in Niger. He was frustrated that he had lost his place to live while he was out of the country. I rent a small house where I work from 9am to 5pm, so I suggested he live in it from 5pm to 9am until he got a new place. We shared the house in this way for seven months. When the green curtains are open, Oumarou is looking at Instagram. He posts pictures of soccer games, family, luxury hotels and beaches (from his side job as a travelling bodyguard). On 8 November 2016, he posted a video of himself voting for Hillary Clinton: I vote for Her. First time voter, historic day. Since we were registered to the same address, I showed him our polling place and we voted together. On 9 November, he wrote: The way I feel last nite was the worst feeling I ever have in my life. We love you Hillary this pain will go forever. Later that day he wrote: Motherland we coming back, and I wondered if he really would go back to Niger. On 10 November he posted a video of himself in the black suit he wears to drive for Uber; he was standing tall by a rooftop pool in Beverly Hills. I'm the president, baby, he said. And then, speaking as the president, he told us to: Stay focused, stay humble, you know, be positive in life, enjoy, life is beautiful, baby.